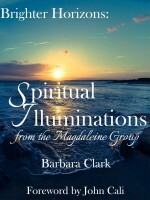 As many of you know, our dear friend Barbara Clark published a book last week, Brighter Horizons: Spiritual Illumination from The Magdaleine Group. The Magdaleine Group are a powerful gathering of non-physical spirit guides whose greatest passion is teaching us we are all connected, and we can communicate with each other in the blink of an eye. We just have to quiet our minds, get into the right vibration, listen and trust. Here is an excerpt from Chapter 23 of Barbara’s book. We are eternal beings, you are the same as us, we are the same as you; and in our core we are love, we are consciousness, we are radiant, illuminated, luminous beings and we are all part of all that is. We are the beautiful heart beating love at our core and it is much, much, much easier for us in non-physical to be only aware of our core, because as we have said before in this book, we do not have the distractions of physicality. But you are the leading edge; and those of you who are coming back to your core whilst still being in the physical bodies in this time of great change on the planet, are doing the most enormous, loving service for us all. You are expanding consciousness, you are bringing the core love from spirit into human society; and you have chosen to be the bravest, strongest messengers that you have ever been! You have all, the people that we are talking to now and the one we speak through, you have all been messengers. You have all been warriors, you have all been learned, you have all been wise ones, you have done it all. This time however, you are in for the long game and that can be draining. We know this, that can be draining, it can be exhausting, it can be heartbreaking and it can feel soul-destroying although of course no soul can be destroyed. But we understand the term and we understand the feeling. Be proud, messengers, be proud. This time you are transcending, you are building a bridge, you are creating the bridge, you are maintaining the bridge. You are establishing the bridge and once established, bringing the love from spirit into your consciousness of who you truly are, becoming more heart-centred, becoming more loving, becoming more compassionate and spreading that light around the planet. You are only to be admired and loved, and this is why so many channelled entities will say they would wash your feet! So if it all feels a bit too much, call to your family and friends in the unseen, formless dimensions. Because we are your helpers, we are your warriors, we have got your back and this is the truth of how it truly is. Regardless of what it looks like through your human eyes in the snapshot of time that you are reading this and we know who you are and we know when you are reading this. In the snapshot of time that you are reading these words, it may feel very, very different from what we have just described; but believe us, it is the truth. Call to your spiritual family, call to us in these dimensions and we are instantly by your side. And so it is. We speak for all in these realms again when we say, we love you. You are the same as us, we are the same as you. We lend you our strength whenever you ask. Love never dies. Sit for a moment as you’ve read these words, call to us. Ask that we in these realms give you a sign or a hug or embrace, whatever you would prefer. Then sit back and you will feel us, we are there. Believe us, we are there. The End Is Not The End. There Is No End! 1/ You can listen to the audio of this part of the channel on our Facebook page. If you want to hear the audio of Barbara’s original channel, you’ll find it here. Finally, here is the book’s page at Barbara’s website. Barbara Clark is the creator of the Beyond Affirmations: What Your Body Wants To Hear Healing Meditation Series. A reading with Hans Christian King in August 2014 re-opened her channels of communication with spirit and led her to channelling verbally. Her first verbal channel was on the 12th October and spirit dedicated the first chapter or illumination, as the spirit guides call them, of Brighter Horizons: Spiritual Illuminations from The Magdaleine Group on 11th November. No one was more surprised than she was! Barbara’s main website, Beyond Affirmations, is a great resource for information about how your emotions affect your health and what you can do about it. Meditations are available for download. Or you can get her mobile app and enjoy a free Relaxation and Well-being meditation. Barbara would be absolutely delighted to hear of your experiences as you work through the “tricks and tips” in her book. If you would like to connect and share experiences or discoveries about your journey through the book, connect with her on Facebook. Thank you both-Barbara and John ,for all you do! I think a big” I love you” is in order—that was a wonderful reading! I LOVE YOU, John and Barbara! Thanks very much, Cathy! You’re very kind. Thank you so much, Cathy. I am deeply moved, bless you. I hope you enjoy reading it as much as we enjoyed writing it. You’re most welcome, Linda! And thank You!